Today's Activities:Upon arrival at Sanya Phoenix Airport, you’ll be greeted & warmly welcomed by our professional English speaking tour guide. Transfer to the hotel which you booked before. 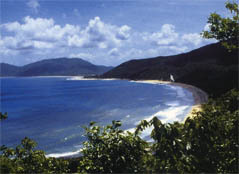 Today's Activities:After breakfast the tour guide will lead you to Yalong Bay and enjoy the sunshine on the best beach. Then you will drive to Li and Miao Minority Village, which are the two minorities living on Hainan Island. Many representative cultural objects related to Li and Miao minorities were put together in this village to give people an understanding of their life style.In the afternoon, your guide will lead you to Xinglong tropic arboretum. It is located in the Xinglong Hot Spring Scenic Area.Xinglong Tropical Botanical Garden is a bright pearl of sceneries explored by Hainan tourism. It enjoys a worldwide fame for its unique and abundant tropical plants. Today's Activities:Today we will firstly visit The end of Earth and The Corner of the Ocean. Located 23 kilometers west of Sanya city, this spectacular place face the endless sea with Maling Mountain at the back, coconut trees and numerous rocks scatter on the sand, the Chinese characters on the rock means "the end of earth and the corner of the ocean" which witness a moving eastern love story of Romeo and Juliet. In the tourism zone, you can stroll on the beach, watch the wave, listen to the sea sound as well as collect shells. After lunch you will visit Nanshan Cultural Tourism Zone in Sanya. As a National AAAA Class Scenery Park, the tourism zone provides you with an ideal paradise where you can worship the Buddha, eat the vegetarian food and view the enchanting scenes.